you all bless me so much! thank you for the sweet comments on my last post with the little mr.
you have no idea how sweet that little guy is. and how he brings so much love to and around this crazy family of mine. and you all add to that so much!!! this was done with may's work in progress. (oops, sold out! again!) layering is the current technique of choice in recent days. cards are such great show cases of this. supplies used include basic grey's life of the party. that paper was sewn to the base of the card, with a stash of notched ribbon attached to the top and sewn at the same time. 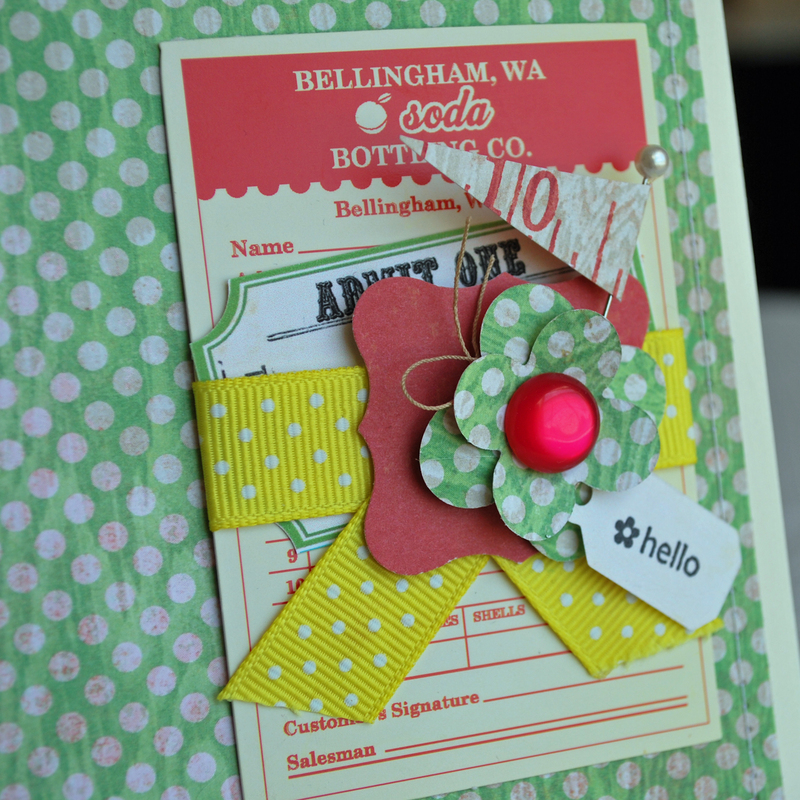 the soda punch out card is the home for all the layered goodness. tickets are a current joy to me and found in most projects of recent. on top of the ticket is found a curly label punched from more basic grey life of the party with a homemade flag pendant stuck in. the flower was die cut and layered with a button on top. the tag was also die cut and stamped to add a sentiment. so 'hello' to you today on this fine spring day. Why didn't I think of this brilliant card idea? LOL. Seriously adorable stuff!!! the layering is so so so adorable!! Love that pin and little flag you made too, so so so cute!! Awesome card Jamie! I love the yellow ribbon and the many layers! EEEK, how cute this is, Jamie! 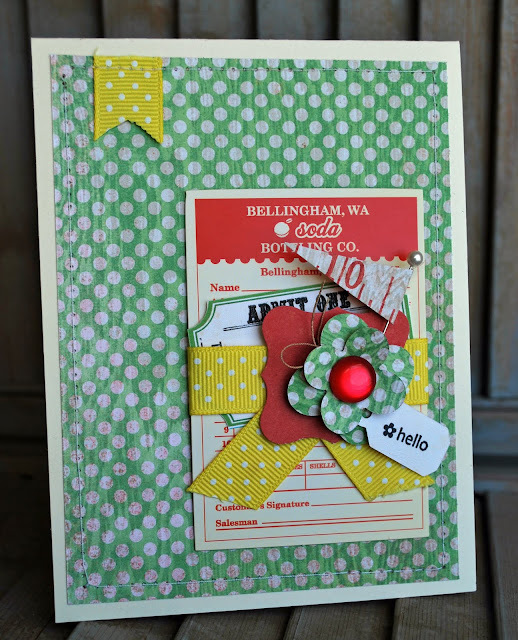 I love anything with polka dots, so of course I absolutely adore this card. Love the layered die cuts, and love the pop of yellow on the ribbon, and that little banner flag is so stinkin' sweet! I love it to pieces!!! This card makes me want to scrap with you! !